The Strymon Ojai High Current DC Multi Power Supply provides a much needed stable source of energy for your pedalboard setup, guaranteeing immaculate tone throughout the most demanding of performances. For those with an enviable arsenal of boutique pedals, it is crucial that clean, steady power is fed consistently to ensure that no matter how hard you rock out, there is no drop out or power surges that could harm your precious gear. The Ojai is equipped with five high-current, individually isolated, ultra-low-noise outputs that each have its own dedicated regulator and custom transformer. Each output provides a generous 500mA of currents at 9V, which is perfect for most standard stompboxes and boutique pedals. 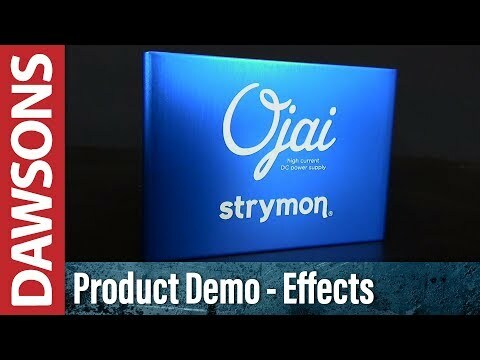 As we've come to expect from Strymon, the Ojai power supply is designed to exceed the demands of today's professionals. Features includes dual-stage topology, pre-regulated outputs, optically isolated feedback, and advanced multistage filtering to create a unique system that enables you pedals to each achieve their highest possible dynamic range. The all-analogue circuitry offers two stages of isolation, which completely eliminates group loop and noise issues, so that any dreaded electrical hum doesn't become a feature of your tone, preserving the true character of your pedals in all their glory.